This summer Disneyland Resort invites Guests of all ages to the highly anticipated opening of Pixar Pier, the summer’s most exciting must-see destination! Would you like to win a 4-day/3-night trip for four (4) including you and 3 guests to Disneyland Resort in Anaheim, CA then you must enter the Disney Parks Pixar Pier sweepstakes now through May 4, 2018 for your chance to be among the first to discover Pixar Pier, a newly reimagined land where some of your favorite Pixar tales come to life. The sweepstakes is open only to legal residents of the 50 United States or the District of Columbia and Canada (excluding Quebec) who are at least eighteen (18) years of age or older at the time they enter the “Pixar Pier Sweepstakes”. 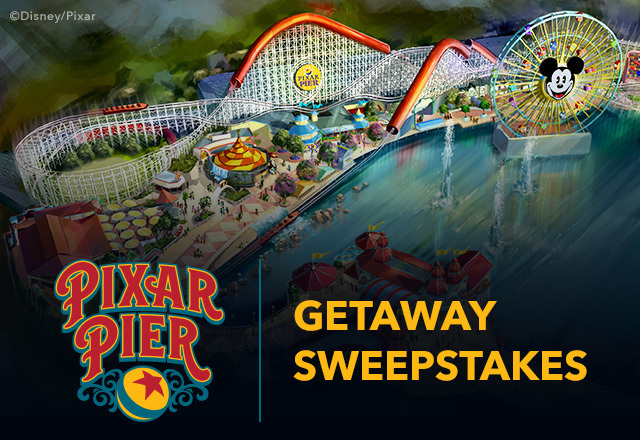 The Disney Parks Pixar Pier Getaway Sweepstakes begins at 12:00 PM Pacific Daylight Time (“PDT”), April 3, 2018 and ends at 12:00 PM PDT, May 4, 2018.